ADULT: Wingspan - 40-46mm.The forewings are rounded, broad and are a dull grey with numerous black markings. 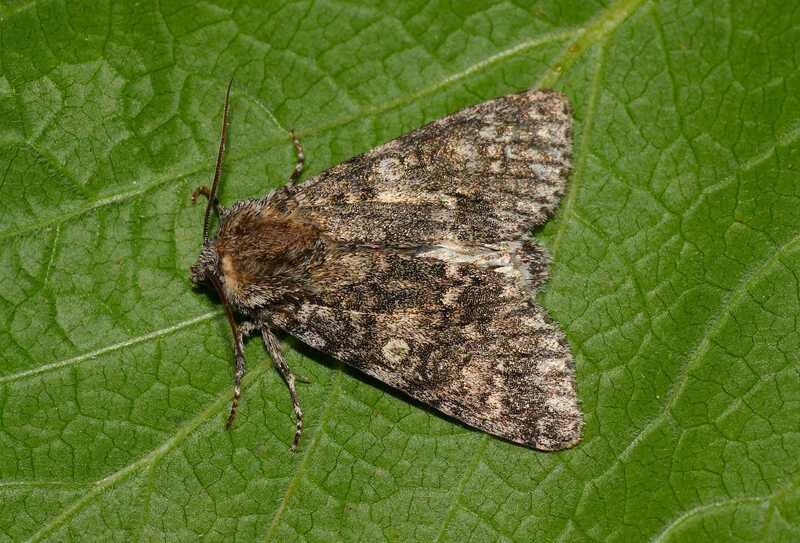 The main ID feature is the pale orbicular mark (stigmata) and the white hindwings. CHRYSALIS: Overwinters in this stage. LARVA: Grey with red and black markings and a whitish patch towards the rear. Quite hairy and feeds on Poplars and Willows. When at rest adopts the position of a question mark. BEHAVIOUR: Attracted to light and sugar. HABITAT: Open woodland, parks, gardens and fens. FLIGHT PERIOD: May to August. STATUS: Resident. Common except from far north.